Feb 10, 2017 | For the safe operation of ESK products please read and observe carefully the respective assembly and operating manuals. ESK components and pressure vessels are exclusively used for cooling systems. They correspond to the EC pressure equipment directive 2014/68/EU. Operation is only permitted if the installation was carried out in accordance with legal regulations. Any components and accessories are provided for the maintenance, installation and use by professional and qualified assemblers, installers and operators. They must have comprehensive knowledge on cooling technology, refrigerants and cooling machine oils. Any work at the components requires specialist knowledge and shall therefore only be carried out by trained and instructed staff. The inappropriate installation or misuse of the device may result in material damages or personal injury. For the safe functioning the assembly instructions and usage limits (pressure, temperature, media) must be adhered to. When using high viscosity refrigerant oil > 46 cSt, the correct function of the components must be controlled and monitored during operation. Where applicable, corrective measures must be taken. Before filling the cooling system with refrigerants, a leakage test of the system as well as of the mounted ESK components must be performed. No oxygen may be used in pressure tests. For the maintenance of refrigerants and cooling machine oils and performance of works on the filled cooling circuit the corresponding accident prevention regulations must be observed. The relevant environmental regulations must be observed when disposing of old oils or refrigerants. All works on ESK products must only be performed in pressure-free and cooled condition. This is specifically valid for the opening of the devices or dismantling of components. Use only ESK spare parts for servicing. During operation severe risk of injury may exist when surface temperatures are within a range of - 40° … +140°C. Electrical connections may only be performed by specialist staff. Before opening the device, always disconnect the device from the main power supply. The electrical connections must be protected against humidity. ESK produces components for sub- and transcritical running. The refrigerant is colorless and odorless, and is not noticeable upon discharge. Inhaling elevated concentrations can lead to unconsciousness and suffocation. Ventilation of the machine rooms must be carried out in accordance with EN 378. It is not allowed to connect a tube to the safety valve, in order to avoid blockage due to dry ice accumulation during opening. There is an increased risk of light inflammability, toxic effect and explosiveness. Refrigerant-specific knowledge as well as strictly keeping the safety regulations are fundamental requirements for the production and operation of such systems. Only components shall be used that have been constructed and released by ESK for such installations and/or operations. When returning components the devices must be exhausted completely by the return sender. The devices are delivered without oil and refrigerants and in an appropriate packaging. Please observe that despite of system standstill components for the level control and regulation can still be under pressure. The highlighted components are pressurized, opening is thus only allowed in pressure-free condition. 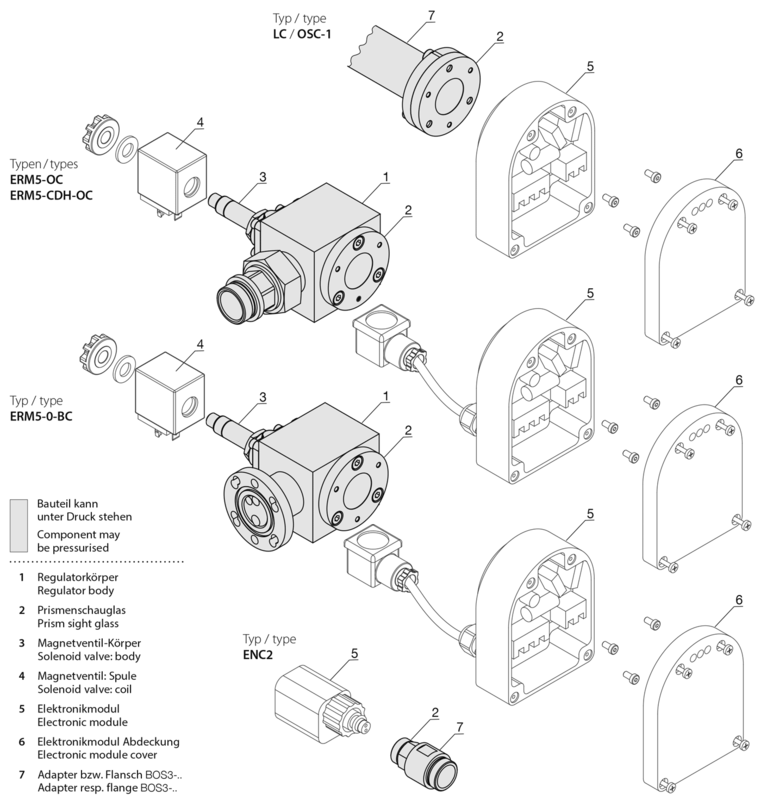 Components that can be dismantled in operation are the coil of the solenoid valve (4) and the electronic module (5).